A public hearing on the August 1 violence entered a third day at a hotel in the capital yesterday, with Zanu-PF supporters claiming that the army cannot be blamed for the election unrest that turned deadly as soldiers opened fire on opposition protesters, saying the MDC Alliance should take full responsibility for the loss of lives. This emerged at a public hearing of a commission of inquiry put in place to investigate the post-election violence that left at least six people dead and countless others injured. The commission includes former South African president Kgalema Motlanthe, presidential candidate Lovemore Madhuku, former Tanzania defence chief Davis Mwamunyange, former president of the law society of Zimbabwe, Vimbai Nyemba and British human rights lawyer Rodney Dixon QC. The seven-member team is looking into events preceding the violence on August 1 and the "motives and strategies employed in the protests". The commission is also investigating the circumstances which necessitated the involvement of the military in the maintenance of law and order and whether the degree of force used was appropriate to the threat. The army was deployed in the capital after police proved unable to quell MDC demonstrators who claimed the historic July 30 election was being rigged. Much of the city centre resembled a war zone, with military helicopters flying overhead, armoured personnel carriers moving through burning debris and patrols of soldiers chasing stone throwers down narrow streets. Terrified citizens took cover in shop doorways or behind walls still covered in posters bearing portraits of election candidates as volleys of shots rang out and stones flew through the air. Witnesses reported seeing soldiers beating people with makeshift batons and shooting wantonly. Despite relatives testifying that their deceased relatives were murdered by members of the military, pro-Zanu-PF backers justified the use of deadly force. 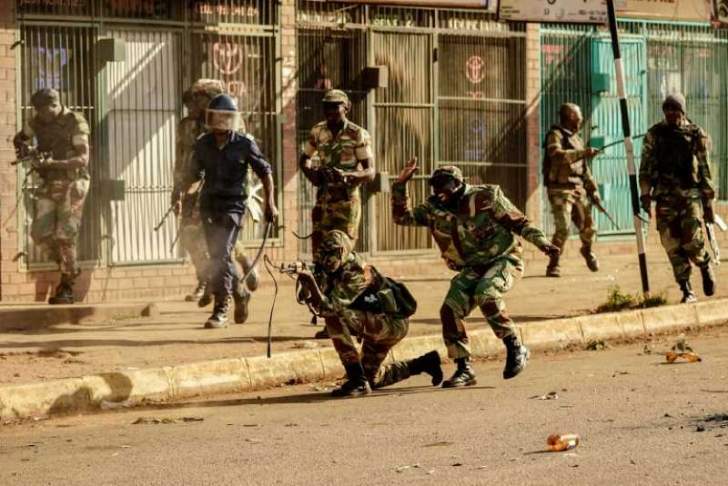 Tendai Chirawu, the secretary for administration for the Zanu-PF youth league, justified the involvement of the army, saying it was clear that the police with their water cannons were unable to control the marauding crowds. "He said the intervention of the police was fully justified in the interest of maintenance of law and order. Terrence Mugwadi, a political commentator who made it clear in his testimony that he was a supporter of the ruling party, said he did not witness the army action on August 1, but claimed there was a clear putsch by the MDC Alliance to unconstitutionally seize power. "This was not a demo for results but an attempt for power seizure. "War songs were being sung and people were frog-marched into that demo. MDC engages in violent activities within the CBD; they think they own Harare," Mugwadi said. "I wouldn't want to give speculative evidence on what I saw. I cannot say I saw the army." The MDC has made statements challenging the composition of the commission and alleging that it has ‘‘murky'' intentions against the party. Testifying on Wednesday, secretary-general of the MDC youth, Lovemore Chinoputsa said the commission had an agenda of smearing dirt on the MDC, a development that is surprising in a ‘‘new dispensation'' where relationships are expected to be amended. Ignatius Neshawa, a brother in–law to the late Ishamel Kumire - a vendor who was shot in the cross-fire - said the soldiers showed no mercy as they unfurled their operation. He told the commission that when he tried to present the bullet cartridge to the police after the incident as evidence, he was rudely dismissed. "I saw my brother-in-law falling; he actually fell on my feet. I thought he had tripped and fell as people were running away from the soldiers. He had fallen head wards, when I turned him, I saw a cartridge," he told the commission. "About nine soldiers arrived on the spot; one pointed a gun at me and told me to leave immediately. He was actually ready to fire. "I told him to go ahead and shoot as they had already killed my brother-in-law." The testifying relatives alleged that hospital officials made attempts to conceal the cause of death as gunshot wounds. He said the number of people who were killed on the day in question was also understated.